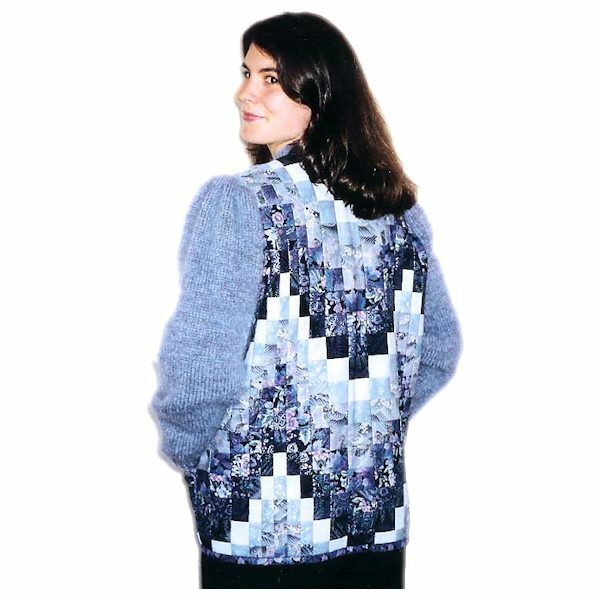 My quilted bargello jackets with knitted sleeves and collar are all one-of-a-kind wearable art. I will repeat the same color family, but not exactly the same fabrics or yarns. The knitted sleeves mean that the jacket is not tight through the shoulders, but allows for stretch and movement. My basic jacket uses two yarns knit together for sleeves that are heavier than a sweater sleeve and make the arms as warm as the body of the jacket which has a dense cotton batting in it. This jacket is perfect for the fall and spring in New England. I also make a lighter weight jacket using a light weight cotton batting and mostly cotton in the sleeves (I always combine some wool in the sleeves so they will not stretch like all cotton yarn does).